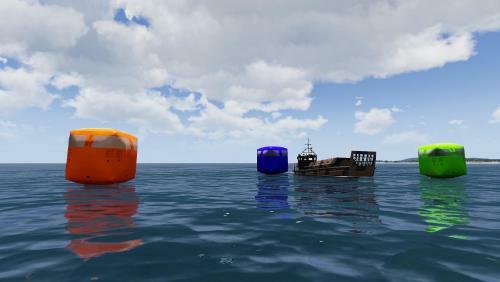 This addon adds a number of targets, props, objects and escaped easter eggs. During the development of our addons we created a number of addons to help test and train member's of our affiliated Gaming Units. PLEASE NOTE: This is just an initial release and will be constantly added to as an when new objects are available. 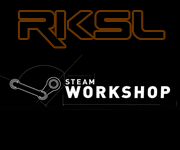 - RKSL Studios addons are distributed without any warranty; without even the implied warranty of merchantability or fitness for a particular purpose. 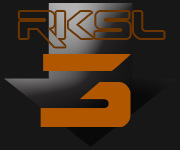 - The RKSL Studios addons are not an official Addon or tool. - The use of these addons (in whole or in part) is entirely at your own risk. 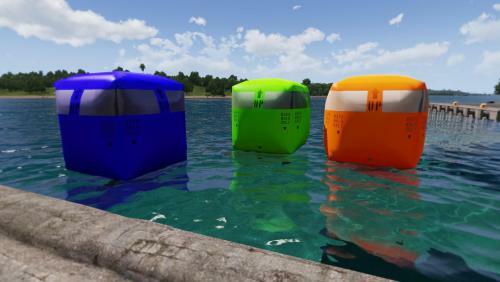 These are 4m inflatable cubes typically used for small arms and crew served weapons practice from Warships. Designed to slowly deflate once hit to allow a decent training time period they will take multiple hits from largish caliber round before deflating. For the purposes of the game we have made these both IR and Radar emitters. They also present an easily lockable visual target. We've been using these to test new aircraft and weapons for a while now. They come in three colours: Orange, Blue and Green. A 6m x 1m cloth banner target designed to be used to test a Pilot's skills with aircraft guns, but can also be used for tanks and missiles if desired. It's up you how you use them but In our gaming groups we usually have a scripted training mission which records the hits. And can reset the banner once destroyed. An example mission may follow at a later date. 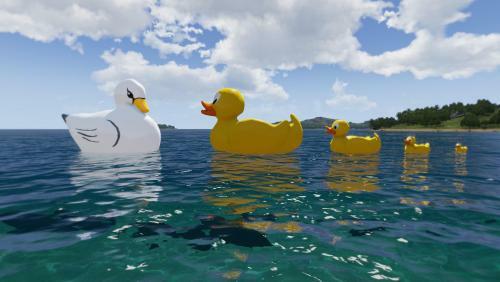 Who doesn't love a Rubber Duck? 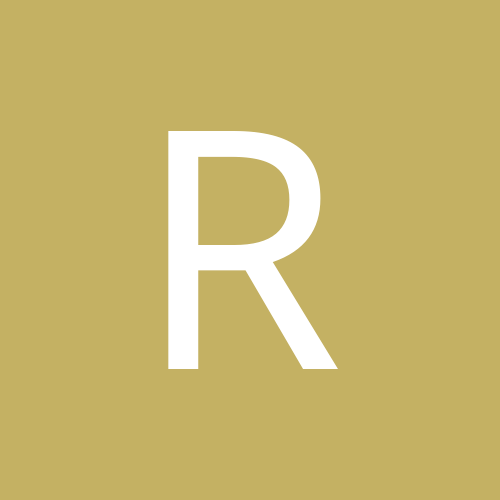 Born from an April Fools joke, the rubber duck has become a bit of a running theme in RKSL addons and our affiliated gaming groups. We've added them because, well why not? It's a bit of a laugh really. We've been pranking each other with them for a while. Dropping them on each other, hiding them in missions, generally Ducking around. And we guarentee your kids will love them. Oh and they act just like the Killer Tomatoes when shot at. The Ducks come in 4 sizes. And because WLD427 mentioned that his daughter had a (rubber) Swan we present: April's Swan. A bit like a duck, the same basic functions, but 'prettier'. 4) Project UKF Lilt Can. A nod to our old friends of the OFP/ArmA1 and ArmA2 Project-UKF Mod team from days gone past. 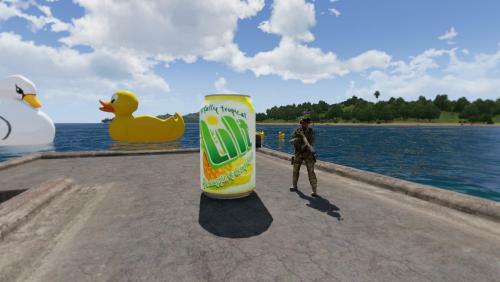 We added their 'trademark' Lilt Can to the game to mark some fond memories. The can is 2,2m tall, can be sling loaded, lobbed, rolled and generally hurled around to create mischief and chaos. Why? Well, much like the ducks, because we can. And it's a bit of a laugh really. It started out as way to test the physX and just got silly. Just like so many easter eggs. 5) 500 Gallon (2275 Litre) Flexible Fuel Tank. Arguably the most useful object in the pack at the first release this is a silingloadable fuel tank. 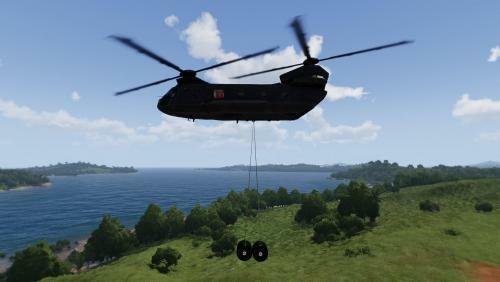 It weighs 2275kg so most helicopters could lift it allowing you to bring fuel to your Forward operating bases. A word of warning, these things do roll so you need some skill to deliver them safely and some chocks to prevent them rolling around your compound and taking out your team. The second version of this is the double pack. This is obviously two blivets strapped together. And obviously holds twice the fuel or the single. But it weighs twice as much, which means you need a heavy lift helicopter to lift it. The added bonus is that it won't roll away on you and squish your men.